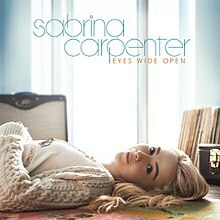 Eyes Wide Open is the debut studio album by American singer Sabrina Carpenter. It was released by Hollywood Records on April 14, 2015. Carpenter began planning the project in 2014, after she launched her debut EP Can't Blame a Girl for Trying, she wanted to make a full-length LP. All the tracks on that EP were included on the album. The majority of the album was recorded in 2014, but she recorded since 2013 until 2015. The album was produced by various artists like Jerrod Bettis, Mitch Allan, Brian Malouf, Jim McGorman, Steven Solomon, Captain Cuts, Matthew Tishler, Jon Ingoldsby, Jon Levine, Jordan Higgins, Matt Squire and John Gordon. Musically, the album has a pop sound with folk, pop rock and teen pop influences. Its production consists on guitars, piano, drums and keyboards. In general, the album talks about Carpenter's personal experiences, friendship, love and teenage problems. The album debuted at number 43 on the US Billboard 200, number 31 on the US Billboard Top Album Sales chart, and number 14 on the US Billboard Digital Albums chart. The album sold over 12,000 copies in its first week release. Eyes Wide Open produced two singles, "We'll Be the Stars", released on January 13, 2015 and the titled-track "Eyes Wide Open", released on April 7, 2015. Carpenter became heavily involved with the Disney Channel in 2013, making various appearances on soundtracks like "Smile" for the album Disney Fairies: Faith, Trust And Pixie Dust and "All You Need", featured on the Sofia the First soundtrack. In that same year, Carpenter signed a record deal with Hollywood Records to release her own music. Carpenter was planning to launch an EP and then release a studio album. She released her debut EP Can't Blame a Girl for Trying with four tracks in March 2014. The final cut of Eyes Wide Open contains twelve tracks, four of them were in Carpenter’s debut EP Can't Blame a Girl for Trying. The album is a teen pop and pop folk record, full of acoustic and country styles. It embodies influences of pop rock, power pop and hawaiian folk. In all of the songs Carpenter talks about personal experiences, friendship, love and teenage problems. Four songs were written by Carpenter. Eyes Wide Open begins with the title track “Eyes Wide Open”. The song demonstrates a "darker mood" where Carpenter sings about finding who she is and her path. Her favorite lyric on the album is the opening lyric of “Eyes Wide Open” that says "Everybody loves to tell me / I was born an old soul." "Can't Blame a Girl for Trying" is an acoustic guitar-pop folk song who talks the being foolish in love and making mistakes, but never blaming those who make them. According to Carpenter the song "perfectly describes a thirteen-year-old girl and a teenage girl." The third track, "The Middle of Starting Over" has country pop influences. The song talks about moving on, start all over again and forget the mistakes. "The Middle of Starting Over" was compared to Taylor Swift's work in her early albums. The album's lead single, "We'll Be the Stars", was released on January 13, 2015. It made its radio premiere via Radio Disney a day earlier. Carpenter made the lead track off of the album, "Eyes Wide Open", available for those who pre-ordered the album on iTunes on April 7, 2015. It was released as the album's second single, with the music video premiering on June 14, 2015. In 2016, the song won the Radio Disney Music Award for "Best Anthem". Writing for the website Headline Planet, Brian Cantor gave the album a positive review, focusing on the emotion conveyed by Sabrina Carpenter's performance. He wrote, "Decidedly loose in construct but rich in personality, “Eyes Wide Open” provides Carpenter with an opportunity to establish her own identity and leave her own mark." Cantor believed the more heavily produced songs put Carpenter at a disadvantage, playing against her strengths. In particular, he singled out "Eyes Wide Open" and "We'll Be the Stars" as weaker songs on the album that do not showcase Carpenter's talents and personality to their full potential. "With every passing moment–even on her weaker tracks–" Cantor wrote, "Carpenter creates distance between the conception and reality of a teen artist." The album debuted at number 43 on the US Billboard 200, number 31 on the US Billboard Top Album Sales chart, and number 14 on the US Billboard Digital Albums chart. According to Billboard and Nielsen SoundScan, the album sold over 12,000 copies in its first week release. 2. "Can't Blame a Girl for Trying"
3. "The Middle of Starting Over"
4. "We'll Be the Stars"
10. "Darling I'm a Mess"
12. "Best Thing I Got"
Credits adapted from the liner notes of Eyes Wide Open. ^ "Smile: Sabrina Carpenter: MP3 Downloads". Amazon.com. Retrieved May 17, 2013. ^ "Sofia The First Soundtrack Makes Its Royal Debut On Walt Disney Records". MarketWatch. February 12, 2013. Retrieved May 17, 2013. ^ "Eyes Wide Open tracklist". itunes. Retrieved May 6, 2016. ^ "Sabrina Carpenter's "The Middle Of Starting Over" Is Completely Irresistible: Watch The Candy-Colored Video". Retrieved August 3, 2017. ^ "Sabrina Carpenter's "Eyes Wide Open" Video Is Suitably Serene: Watch". Idolator. June 17, 2015. Retrieved August 3, 2018. ^ a b "Sabrina Carpenter - Sabrina Chats "Eyes Wide Open"". YouTube. Retrieved July 31, 2017. ^ "Sabrina Carpenter on "Eyes Wide Open"". Justine Magazine. Retrieved July 28, 2017. ^ ""Darling I'm a Mess" on Genius". Genius. Retrieved May 9, 2016. ^ ""Best Thing I Got" on Genius". Genius. Retrieved May 9, 2016. ^ "'Girl Meets World' Cast Member Sabrina Carpenter Announces New Single, 'We'll Be the Stars' On Twitter [Exclusive Cover Art HERE]: Fashion & Style". Fashion & Style. Retrieved February 24, 2015. ^ "Sabrina Carpenter 'We'll Be The Stars' Release Date Announced". J-14. January 9, 2015. Retrieved February 24, 2015. ^ "Sabrina Carpenter - Twitter". Twitter. April 7, 2015. Retrieved May 11, 2015. ^ Vulpo, Mike. "Radio Disney Music Awards 2016 Winners: The Complete List". E! Online. Retrieved May 1, 2016. ^ "Sabrina Carpenter is the Right Kind of Great on "Eyes Wide Open;" Review". Headline Planet. April 13, 2015. Retrieved April 16, 2015. ^ "Billboard 200 Chart Moves: Little Big Town Returns to Top 20 in 'Girl Crush' Rush". Billboard. Retrieved August 20, 2018. ^ "Sabrina Carpenter Chart History (Billboard 200)". Billboard. Retrieved February 20, 2019. ^ "iTunes - Music - Eyes Wide Open by Sabrina Carpenter". iTunes Store (United States). February 24, 2015. Retrieved February 24, 2015. This page was last edited on 24 February 2019, at 04:22 (UTC).